WATERBURY - The 6th Annual Quilts that Care Fundraiser is set for Thursday, Oct. 11. 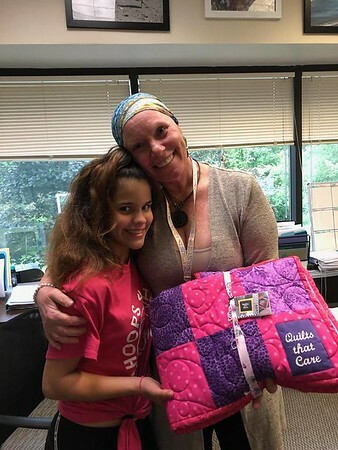 This nonprofit charity makes quilts that are then given to cancer patients who are undergoing treatment. Since beginning in 2012 with a few women, the charity has now grown to over 200 volunteers who have donated over 2500 gifts. The fundraiser plans to show off some of the quilts with music and food as part of the festivities. Admission is $45 and can be purchased ahead of time at the Quilts that Care HQ at 130 Scott Road in Waterbury or by calling 860-782-1043. Dr. Joseph Ravalese III will be honored at the event for his support of Quilts that Care. He is a Therapeutic Radiation Oncologist that has worked with The Harold Leever Regional Cancer Center, St. Mary’s Hospital, Waterbury Hospital and Bristol Hospital. To help sponsor the fundraiser, email . The event runs from 5 to 8 p.m. at 180 Scott Road in Waterbury. Parking is available at the venue. Call 860-782-1043 with any questions. Posted in New Britain Herald, General News on Tuesday, 7 August 2018 20:13. Updated: Tuesday, 7 August 2018 20:15.